The entrance of the CG government's culture and tourism exhibition venue at Rajim kumbh 2018. 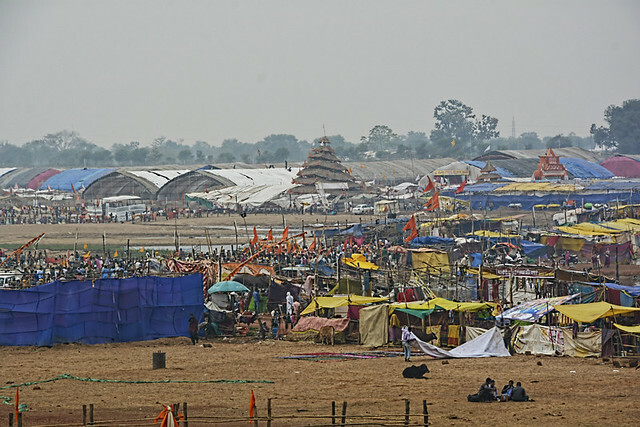 The principal attraction of this kumbh was the river marathon, organised by the state government to conserve and save the Chhattisgarh rivers. But, even after the massive fanfare, the government failed to protect, clean or conserve any of the rivers in Chhattisgarh. The Mahanadi is the lifeline for the residents of Rajim and Nawapara, the twin cities bordering Gariyaband and Raipur districts of Chhattisgarh. 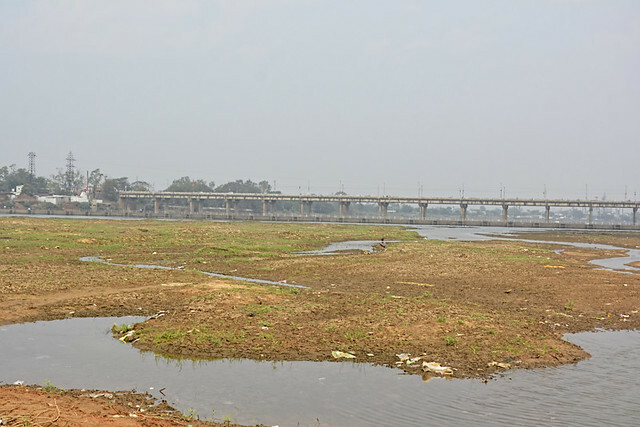 Around 70,000 residents of Rajim-Nawapara are dependent on the Mahanadi's water for domestic use. 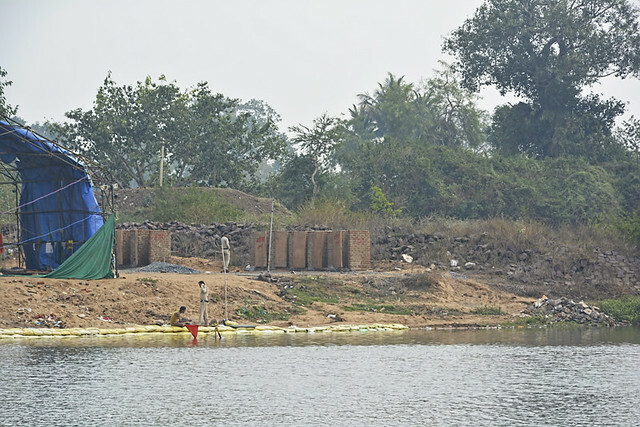 As per the residents of Rajim-Nawapara, the sand from the Mahanadi basin is excavated and transported to the state capital and nearby areas to meet the growing infrastructural needs on a regular basis without any regulation. 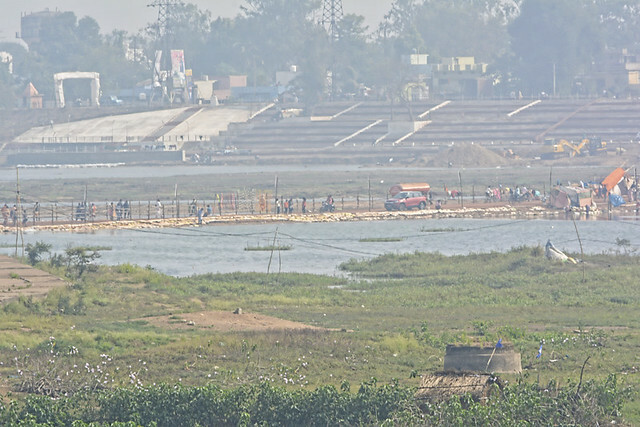 Every year, temporary morrum roads (red soil roads) are made on the Mahanadi basin for the kumbh, and after each kumbh, the government does not even try to bring back the river bed to its original state. The morrum roads have affected the overall ecology of the river and its flow. "Since 2006, more than Rs 40 crores has been spent only on building 10-15 km of temporary roads for kumbh. I have been raising my concerns over building roads on the Mahanadi river bed and have opposed the state government’s decision several times because it is affecting the river,” says Dhanendra Sahu, MLA from Abhanpur constituency. The residents of Rajim-Nawapara also shared their concerns with India Water Portal about the proposed cement road on the Mahanadi river basin and the adverse effects of kumbh. 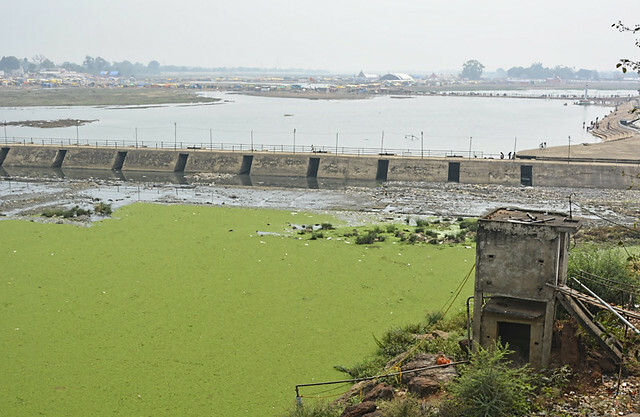 “The mela is killing the river and have adversely affected its ecology. We are not even getting safe drinking water. Every year, water-borne diseases like jaundice, typhoid, etc. are increasing, and the groundwater table in our area is going down,” says Kamlesh Kansari, a resident of Nawapara. 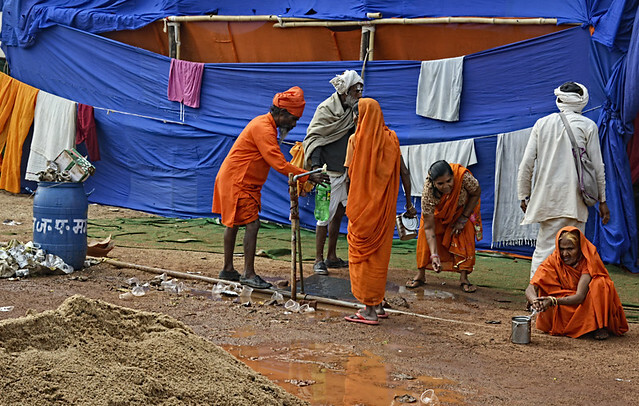 The state government constructed more than 600 temporary toilets within the Mahanadi river basin for the kumbh. But due to poor maintenance of the toilets, the people were forced to defecate in the open. The government authorities have failed to fulfil the much-hyped objective of Swachh Bharat mission also. Several participants of the festival from other states like Uttar Pradesh and Bihar complained that they were not at all happy about the basic arrangements provided by the Chhattisgarh government such as drinking water and sanitation. Some senior Naga sadhus even protested and said that this is not the way to save any river. “The kumbh melas in the country nowadays are planned for political gains. There is a need to stop this political drama around rivers. The rivers are not meant for defecation,” says a senior Naga sadhu. "The pollution in the Mahanadi is increasing every year. The sewage and the industrial waste from rice mills have choked the river flow. The water of Sondur, Mahanadi and Pairi are not even fit for domestic use. What will we do?" asks Subhash Sharma, a resident of Rajim in a worried tone. These photographs provide a glimpse of the dilapidated state of the Mahanadi river and its basin. 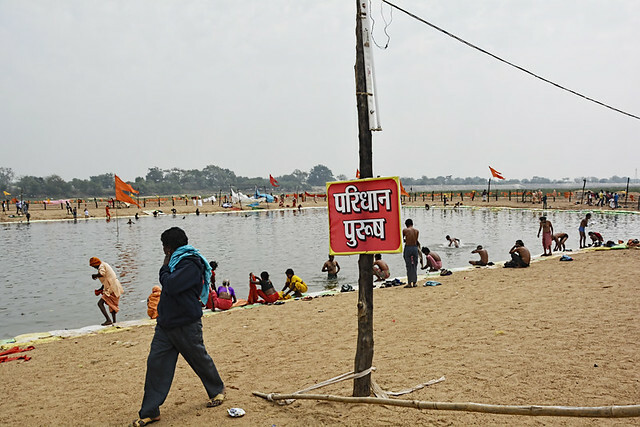 See more photographs of the kumbh here.